They've been as busy as ever at Moon Dog in the past year, although judging by the rate at which special releases have appeared in bottles you may think otherwise. With a large production brewery purchased, installed and now charged with knocking out their core range of 5 percenters and a new function space built and opened too, there's been little time to fire out the sort of beers upon which the Abbotsford brewery made its name – at least on a grand scale. But rectifying that is this pair. Del Polka Vista Forest Fruit Wild Ale, to give it its full name, is the sort of beer to catch your eye from a distance: the collection of berries within give it a genuinely vibrant red appearance, akin to a sugar laden fizzy, fruity soft drink of dubious brand picked up from a dusty milk bar. And the brewers have ensured those berries star throughout, dominating aroma and flavour in a beer that's more tight and tart than wild and sour – high on refreshment, low on anything anyone stepping outside the world of lagers for the first time would recognise as beer. 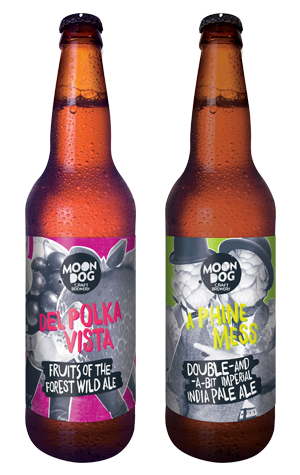 If Del Polka Vista is tight, tart and fruity, its fellow 650ml release is big, brash and bolshy. Phine Mess, a "double-and-a-bit imperial India pale ale" ratchets everything up to 11 (OK, 10.2 percent ABV if we're being precise, but you get the message), packs heaps of punchy hops ready for a fight, a chewy backbone and plenty of booze and bitterness too. A yin and yang pairing if ever there was.